Success of allogeneic marrow transplantation has initially been achieved by selecting human leukocyte antigen (HLA)-identical sibling donors. Subsequent clinical trials have evaluated the use of partially matched related donors and found that the degree of HLA incompatibility correlated with the risks of graft rejection and graft-versus-host disease (GVHD) [1,2].Transplants from related donors incompatible for only one HLA-A, -B, or -D/DRB1 antigen in recipients treated for hematological malignancy are associated with a probability of survival similar to that achieved in HLA-identical sibling transplants. In contrast, transplants from donors incompatible for two or three HLA antigens are associated with lower survival, despite using the best available immunosuppression for GVHD prophylaxis . 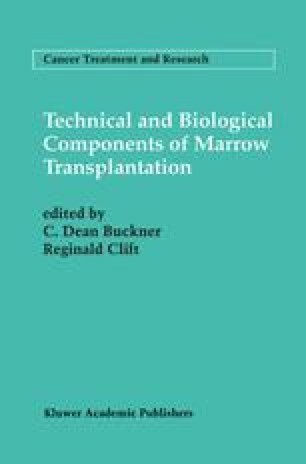 These clinical studies have formally demonstrated that HLA is the major histocompatibility complex in humans, and they have provided the scientific basis and rationale for HLA matching as the primary criteria for selecting unrelated donors for transplantation when patients lack an HLA matched family member. Less than 30% of the patients in North America have an HLA-matched sibling, and 3-5% have a one HLA-locus- mismatched relative. Therefore, for most patients in need of an allogeneic marrow transplant the only chance of finding a suitable donor is through the identification of an HLA-compatible unrelated volunteer. Initial case reports between 1973 and 1986 demonstrated that unrelated donor transplants could be curative in patients with leukemia or with other disorders of the lympho- hematopoietic system. Three major accomplishments have allowed unrelated donor transplants to become feasible and successful: (1) identification of HLA genes and their functional products ; (2) development of precise and efficient HLA typing methods using DNA technology ; and (3) the development of a network of registries containing more than 1.7 million HLA-typed donors worldwide . To date more than 2500 patients with acute and chronic leukemias, lymphoma, myeloma, myelodysplasia, aplastic anemia, congenital errors of metabolism, and other diseases correctable by healthy allogeneic stem cells have been transplanted using marrow from unrelated volunteers . Initial results have demonstrated a higher degree of GVHD in unrelated compared with related transplants despite matching for HLA-A, -B, -DRB1, -DQB, and -DPB, indicating that current assessment of histocompatibility is not yet complete .